This is a painting I did a while ago. It is a metaphor on marriage. Obviously the wedding rings represent marriage. Putting 'marriage' on a pedestal shows high regard for it. A pedestal is a support or foundation of which marriage is that for a vigorous, productive society. Classical column design suggests the highest quality and antiquity. A polished river stone to show that over time imperfections are smoothed out by the course of 2 people learning to live together. It also stands for marriage as the basis for the construction of bigger things, one being a family. As well as a marriage can become 'rock solid'. 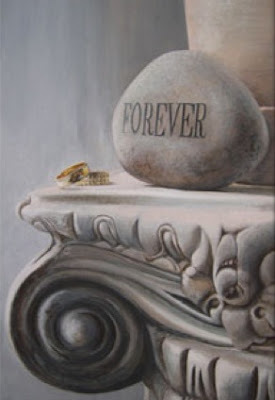 Forever is etched deeply to show the commitment that is takes for a successful marriage and that it can last eternally. Some of the meanings of my marriage metaphor. If you see more or something completely different do share. I know this is not what you meant, but when I first looked at it I saw a fireplace, thus marriage being the warmth and source of comfort and light for the entire home. I see what you mean. I hadn't thought of that. Cool. This is a really wonderful painting with a theme I've not seen much of, and I love how everything in it has meaning. Beautiful!